I saw a reference describing end of summer/start of fall cooking as “valedictory meals”. I prefer to think of this time as a cross-fade. As one season quiets down, another one starts to roar, but for at least a moment they make the same sound. To take advantage of the markets in transition, I made an Argentinian Carbonada Criolla, a heavy beef stew lightened with peaches, pears and corn served in a pumpkin last September. This year I decided to try Mexico’s chiles en nogada. 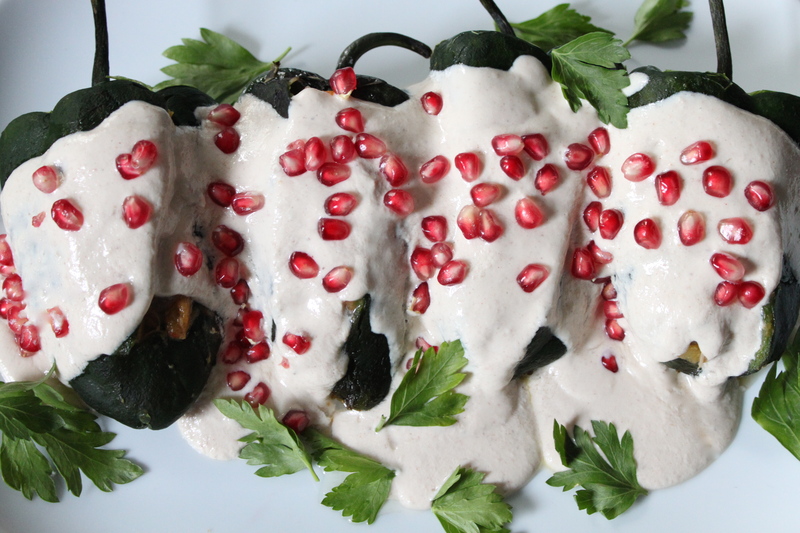 Pork or beef picadillo stuffed into poblano chiles, it’s covered in a chilled, creamy walnut sauce and garnished with pomegranate seeds. Traditionally, it’s served to celebrate Mexico’s Independence Day on the 16th of September. The night before, the current president leads the people gathered in plazas across the country in el grito de la independencia, with celebrations continuing into the following day. For this year’s bicentennial, the ceremony will take place in Dolores Hidalgo, recreating the original battle cry led by Miguel Hidalgo y Costilla there in 1810. 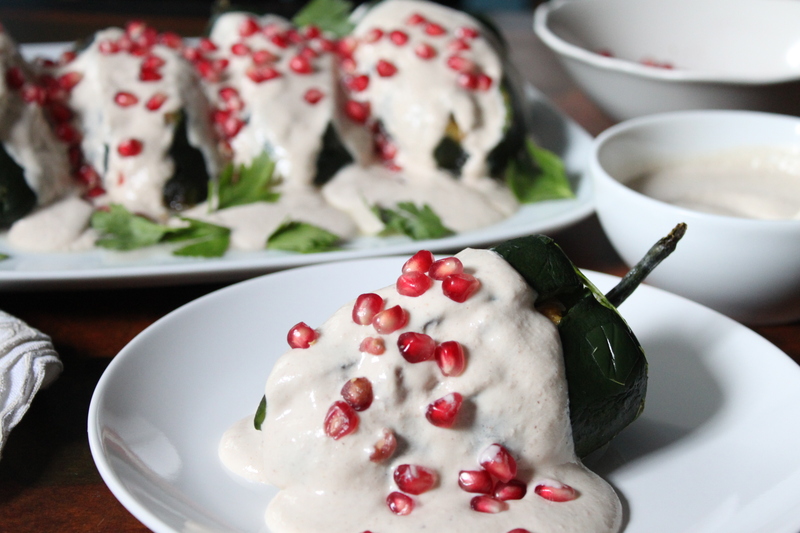 According to historians, the chiles en nogada were created by Clarisan nuns (or Agustinas, there’s some debate) for a banquet in honor of Don Agustin de Iturbide, who had just signed the Treaty of Cordoba at the conclusion of the war with Spain. 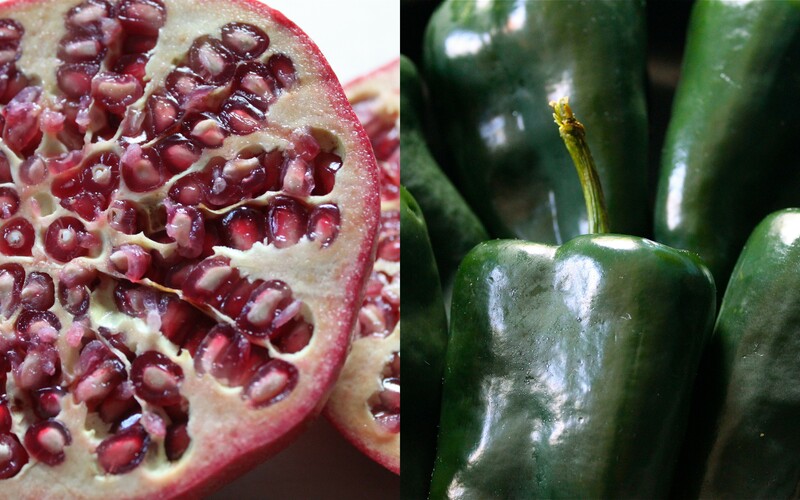 The green peppers, white walnut sauce and red pomegranate seeds were meant to celebrate the colors of the Mexican flag. Hot and cold, sweet and savory, late peaches and early apples – it’s a dish that knows how to be everything at once. Throughout this bicentennial year, Zarela Martinez, New York restaurateur and cookbook writer, has hosted a series of cooking classes, culinary tours and lectures in conjunction with the Mexican Cultural Institute of New York. I decided to make the chiles en nogada posted on Zarela’s site. Click here for the recipe. If you’re looking for other ways to celebrate, take advantage of New York’s Authentic Mexican Restaurant Week running from September 16 through 30. Participating restaurants will feature a three-course menu built around Mexican ingredients with pairings by Tequila Cazadores. Click here for a list of participants. These look so delicious! I’m inspired, can’t wait to attempt to cook them !